One of the first things ones notices is not only how solid, sea worthy and well built SCOTT FREE is but how spacious she is. SCOTT FREE” super structure was built by Delta, her hull is a Westport and she was finished off by Northcoast, located in Tacoma WA in the Pacific Northwest. Some features to note is the large aft swim deck with a hydraulic platform with stairs that unfold and extend into the water creating easy access for swimming, snorkeling, diving and docking watercrafts. Her main saloon is wide, spacious, light and bright. There is a large bar with leather chairs, a player piano, and a 42” hidden flat screen TV loaded with the Blu- ray DVD system, IPod docking station, Apple TV and lots of comfortable seating. Her country kitchen is oversized with three seating areas and a large flat screen TV. Her pilot house has all the modern amenities for navigation and communicating and there is a raised leather settee and table designed to maximize the views when underway. SCOTT FREE has four staterooms. The master has a California king bed, 36’ flat screen TV. The ensuite bathroom has a Jacuzzi tub and dual sinks. There are three other equal ensuite staterooms each with queen beds and a 20” Flat screen TV. 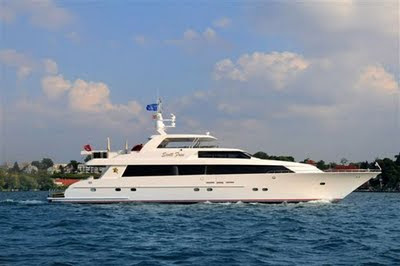 SCOTT FREE has some wonderful on deck amenities starting forward with her large bow sun pad to her aft deck dining area. For an outdoor evening night at the movies enjoy watching your favorite movie on the retractable 60” TV with Blu-ray DVD player or sit snuggled up on the upper deck settee enjoying the fire pit. There is a wet bar and BBQ for alfresco dining. She comes with a 27’ Boston Whaler with twin 225 HP outboards, a 15’ Novurania with 90 HP, Two Hobie pedal propelling kayaks. Lots of towable toys and more.